My grandfather passed away today. He was 93. I love him so much and will miss him. I have never lived a day without Dee in my life. He is and was a solid, loving and stabilizing presence that shaped who I am. I’ve never thought of a world without him, but here on this day, January 10th, 2013, he’s gone and I want to honor a great man who loved me and who I loved. Memories have flooded over me the last few weeks as we expected his Home-going. I remember little things like the Silver Dollar Ceremony. He and Nana had a pool in their backyard. As each of his grandkids reached an age where we ventured into the deep end and started diving, he would say, “Let me know when you are ready for that silver dollar.” We’d practice over and over diving down to touch the drain at the deep end of the pool until we could finally hold our breath long enough to reach it. Then we’d run tell Dee “I think I’m ready for the silver dollar!” He’d ceremoniously bring out the silver dollar and swim down to the bottom of the deep end and put it right on the drain. Then, with cousins, parents, aunts and uncles to cheer us on, we’d dive off the diving board and swim to the depths of the pool. I remember feeling a moment of panic, could I do it? But determination set in. Then, clutching that precious coin we we’d push off the bottom of the pool with all our might and crash up through the top of the water, coin-hand outstretched, and look over for Dee’s proud smile. Such a little thing, but a right of passage we came to expect. We don’t have too many rights of passage today and I don’t know why. It gives a child such a sense of value and accomplishment when they’ve worked hard to reach a goal. I guess Dee knew that. I remember that Dee and Nana always gave us the most unexpected Christmas gifts. They were creative and useful things that I wouldn’t have thought to ask for, but even in those gifts there was a calling up, a chance to be older. One year a fishing tackle box with hooks and bait. I loved that gift. One year a Snoopy Duffle bag. I still have it. It was perfect. I used it for my very first sleep-over. My favorite year, Dee made home-made stilts. This is still one of my favorite Christmas memories of all time. Dee made small stilts for the little kids, tall ones for the adults. We ran all over that yard laughing and racing and face-planting. I am determined to make these for my kids this year. A kid needs stilts. Dee knew that. My favorite thing to do with Dee was to go metal detecting. To me it seemed a wonderful adventure with endless possibilities for finding buried treasure. I would ask him every time I went to his house. He’d pull out his metal detector and we’d canvas the yard. I was the “digger” and he was the “finder”. I remember when the metal detector would start beeping really fast, I’d throw myself down at the spot and start digging. He’d take each scoop in his big hand and we’d run it under the metal detector until we found the scoop with the metal. Then he’d open up his hand and I’d rifle through the dirt until we found the treasure. In reality, we mostly found bottle caps, but that didn’t deter us. It was fun and we were together and it is one of my most precious childhood memories. He kept a big coffee can on his work bench in the garage with all his “finds” and every time we went over, I’d pull it out and we’d talk about all the new stuff he’d discovered. If he found anything really special, he would take it inside to a jar in his closet. He found some neat rings and jewelry over the years, those went inside or he’d give them as a gift to one of the grandkids. Dee went through several models of metal detectors in my life. He knew I loved it so he gave me one of the early ones, which I still have in the garage. I am going to take that to a repair shop and get it fixed so I can take my children treasure hunting in his honor. It strikes me that the strongest and most meaningful memories I have of Dee are from my early childhood, which makes me realize that even though I’m now 38, I never out-grew those early impressions of who he was. This is encouraging and cautioning to me. If I was so molded by my first 10 years, my children and grandchildren will be too. I want them to remember feeling about me, the way I feel about Dee. He was available, positive and present in my life. He was reliable and caring. In my child-mind, Dee was never busy. That’s ridiculous of course because he had a large family and a thriving business but I remember him as available. He took time to listen to me and he spent time with me. He gave me a sense of self-worth. Dee was simple. Even though he made and lost millions in his lifetime, he and Nana were never fussy, never put on airs. They wore simple clothes, ate simple meals. He ate an orange after dinner every night a tradition I keep regularly. He worked in his garage. He drank coffee with his wife and friends. He played cards with his wife. They kept their life simple and I always felt at ease in their presence. Dee was hospitable. I always felt wanted and welcome in their home. I was always greeted warmly with hugs and kisses and lots of love. They had special toys and food they kept just for us. People dropped in unannounced and were greeted enthusiastically. All were welcome. Their doors and hearts were always open. They welcomed my husband into their lives. Dee liked John. He was interested in him and in his work. 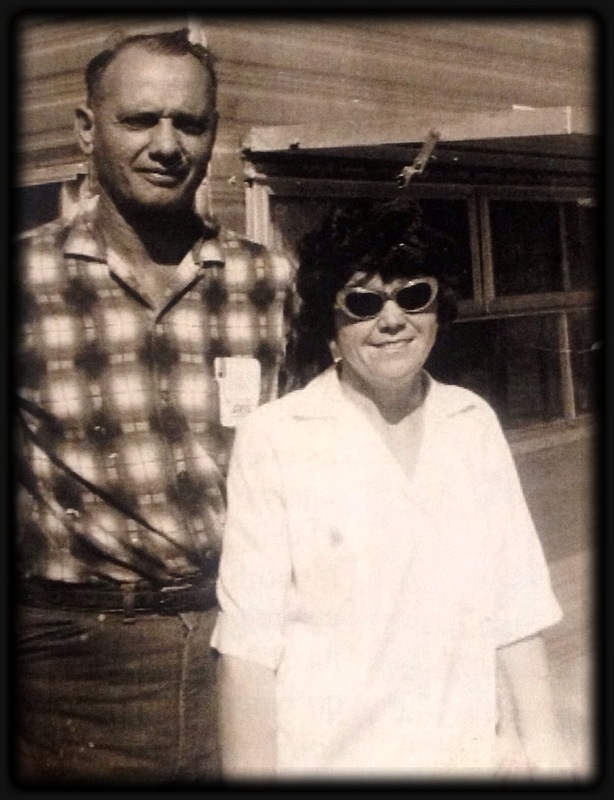 They talked shop and guns and business together and makes me feel good to know that my grandparents loved him. Dee loved Nana. They were happy. They flirted back and forth. They laughed together, they played together and they worked together. Their love stood the test of time. When Dee spoke at my grandmother’s funeral, he called her his sweetheart. I’ll never forget that moment because it was exactly true. She was his sweetheart. I never heard an unkind word pass between them. They showed each other respect and it made a big impression on me. When my grandmother became sick with Alzheimer’s, he stood by her. He packed up his whole life and moved into a trailer outside of her nursing facility just so that he could be with her every day. In my adult mind, this is one of the noblest acts I have ever seen. It makes a huge impact on the way I choose to live and love my husband every day. Isaiah 32:8 “A noble man makes noble plans and by noble deeds, he stands.” This is Dee. I love you so much sweet Dee. I will miss you but I’m glad you are with your Lord and your sweetheart. Thank you for everything you have made me. Oh, April – I’m bawling reading this. I’m so reminded of my own granddad and what a treasure he was. I can see that Dee’s impact isn’t only on your memory but in how you live your life already. Love this tribute. Praying for you and your family. Thanks Sunny. That means a lot. He is/was precious. This is beautiful, April! It is a perfect example or what I had told you about your Dad. Those wonderful legacies continue to pass on and be relived. What a Godly reminder of what family was created to be. Bless you for sharing your experiences with Grady and passing on his legacies to your children. I pray someday we will meet again…last time I saw you, I think you were a baby. Blessings, Sweet Thang! April's House · Perfect is boring. We prefer life unhinged.